World Gratitude Day is celebrated each year on September 21st. It started in 1965 in Hawaii, when a group of people decided to express their gratitude for all their blessings formally. Since then it’s spread all over the world. While the original intent was to set aside one day out of the year to fill our hearts with appreciation, we believe there’s room for positive reflection every day. Gratitude is the idea of being thankful. There are so many different teachings and ideas about gratitude. It could be a simple as saying thank you or as complex as recognizing how blessed you are, for the very air you breathe. There have been multiple studies on the health benefits of gratitude. Most conclude that an attitude of gratitude leads to better overall happiness in your life. At SendOutCards we believe in the spirit of gratitude. It’s part of the reason we began. 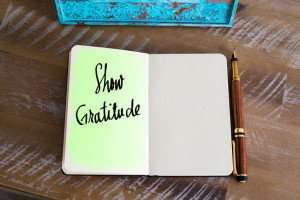 The prompting to send out a card or a gift is part of a gratitude cycle. You want to acknowledge a milestone, express a sentiment and share joy with others when you send out a card. Those are all feelings that come from gratitude. Gratitude is the baseline for love. If you are able to be grateful, you are able to love more compassionately and deeply. SendOutCards was created because we saw a need to express gratitude in a personal way. It isn’t always easy to say thank you and it can be even harder to show it. Sending a gift or a card, that you’ve personally created, is a great way to express your gratitude. It’s personal, heartfelt and easier than ever before. You can set reminders for important days or anniversaries. Simply log on and make a card when you feel the prompting. You can even use it for your business and express your gratitude to clients for their support and encouragement!